Let your little boy reach for the stars in his very own Personalized Baby Boy bodysuit. He will look handsome while he dreams of playing outside in the warm sunshine. 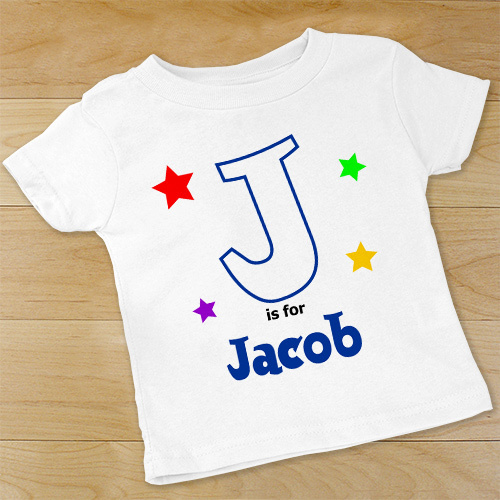 This initial design is printed on our premium, 100% cotton white infant bodysuit or infant t-shirt. Both are high-quality fabric and designed with double-needle hemmed sleeves and bindings. 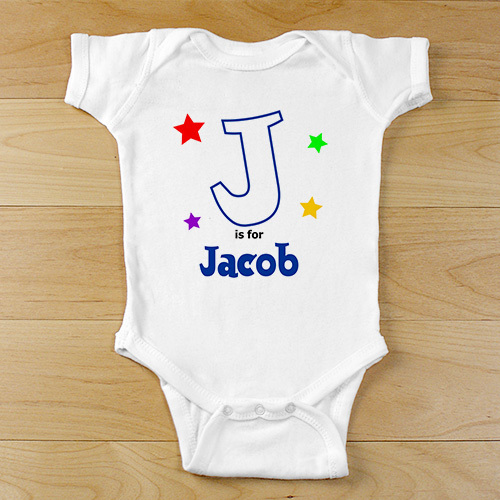 These Personalized Baby Gifts feature a three snap bottom and both are machine washable. This onesie is available in sizes newborn to 18 months and the infant t-shirt is available in 6 months to 18 months. Free personalization of any name is included with all Customized Baby Gifts. In the ad pic the writing appears blue but when I got the order the writing was black. GiftsForYounow.com offers many Personalized Creepers for your baby or to give as a Personalized Baby Gift. We have many designs to choose from. We have infant Creepers with Stars on them. We have Personalized Creepers with Trains on them. Each Creeper is Personalized with your child's name on it. Great to give for a Baby shower or a 1st Christmas Gift.